Fish populations have suffered from over-fishing and loss of habitat throughout the recent past, and climate change has the potential to further affect the well-being of fish in western Washington. Increases in stream water temperature, winter flooding, and frequency of drought are all capable of diminishing fish populations. 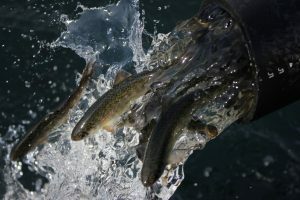 This could have permanent negative impacts on populations of Endangered Species Act (ESA) listed fish such as the summer chum and Puget-Sound Chinook, and on the tribes and fishers who rely on these fish for food, cultural and economic value.